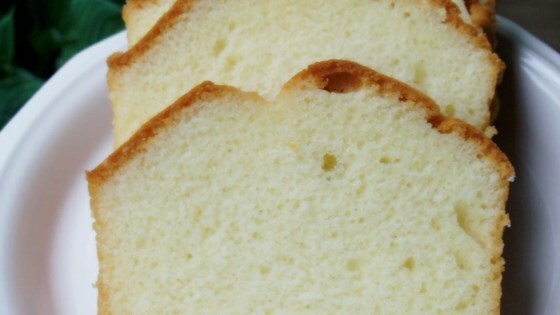 "This recipe is over 100 years old and is the original kind of pound cake: it contains 1 pound each of butter, sugar, eggs and flour and contains no salt, baking powder or flavoring (but flavoring such as vanilla extract or almond extract can be added if desired!)" Preheat oven to 350 degrees F (175 degrees C). Grease 3 - 8x4 inch loaf pans, then line with parchment paper. In a large bowl, cream together the butter and sugar until light and fluffy. Beat in the eggs one at a time. Beat in the flour alternately with the milk, mixing just until incorporated. Pour batter evenly into prepared loaf pans. Bake in the preheated oven for 70 minutes, or until a toothpick inserted into the center of the cakes comes out clean. After removing them from the oven, immediately loosen cake edges with a knife. Allow to cool in pans for 10 minutes, then remove from the pans. Strip off the parchment paper and cool completely on wire racks.